But is now mostly just Cavinator1 :P Enjoy all my awesome maps! 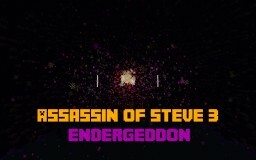 Happy 5th Birthday Assassin of Steve! To celebrate, the 5th Birthday Edition, containing loads of cake and presents, has been released! Dance Floor - a fun dance-themed minigame map by Cavinator1 and CemreK - is now here! BlazeandCave's Advancements Pack is being updated for 1.14 and has recently had its first beta build released! Follow us on Twitter (links above) for news, sneak peeks, and more! A NEW minigame map worked on by Cavinator1 in collaboration with CemreK is now out! Surprise!!! From throwing tridents at zombies to shooting down vexes with lasers, or guessing pixel art to matching beacon colors, there is something for everyone. In other news, recently the first 1.6 Beta Build has been released for BlazeandCave's Advancements Pack, the first beta for 1.14's snapshots! Now containing 100 additional advancements and two more tabs! If you wish to support me (Cavinator1) you can do so on my new patreon page! It would mean the whole world to me if you decided to do so and I appreciate any support I can get. In return patrons can get numerous benefits such as occasional invitations to playing sessions, free invites to Celestial Protocol beta testing, special roles, exclusive teasers, and more. Been a while since the last post, but lots of new updates abound! Recently the 1.5 update to BlazeandCave's Advancements Pack came out, and even more recently its 1.5.1 update added a scoreboard that keeps track of how many advancements you have gotten so far! Great for multiplayer! And... just today, it's exactly one year since Assassin of Steve 3 was released! To celebrate this we put out the 1.2 Anniversary Update which adds Baby Sand Monsters (as petitioned by the community on the Blaze and Cave Discord server... PLUG! ), plus more new weapons, including 15 new chairs and a special new cheat code for chair-only playthroughs! After many, many months, the Update Aquatic has finally hit Minecraft, and that means BlazeandCave's Advancements Pack has now been updated fully for 1.13, now boasting 437 advancements across twelve tabs! A big thank you to everyone who played the pack's beta builds and gave feedback and bug reports! Do you want to voice a character in the upcoming sci-fi adventure map by BlazeandCave? We're looking for potential voice actors right now! Both large major roles and small minor roles available! Male and female voice actors needed! Click the link, fill out the form to apply, and presto!